My brother after running Boston for at least the 3rd time. Note the finisher’s medal! Hi route involves a ferry ride from Orient Point in Long Island to New London, CT. Other than that though, it’s all legs, lungs, and mind that will get him from door to door. All 230 miles of it. You might think he’s insane, or idiotic (my officemate said there’s a fine line between the two), but personally, I’m proud of him. Proud of him for his big heart. Because I know, if anyone can pull this off, and actually do it, it’s him. After all, he’s run two 100-mile races, finishing both of them. 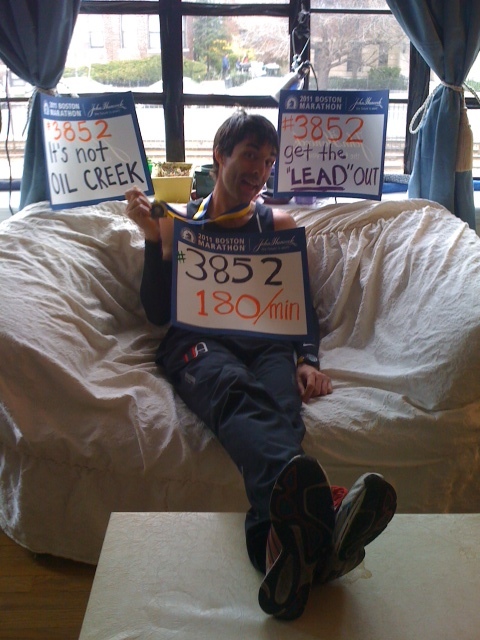 Did I mention one of them was Leadville 100? (Follow this link and you will see an image of runners partly up Hope’s Pass, whose top elevation is over 12K feet.) And that during the first one (you can read his blog post about Oil Creek), he felt an injury about 60 miles in, and refused to give up?? That’s my brother, he has the willpower and the stamina and the “can do it” attitude that many of us can only dream of having. He’s also my inspiration to follow my dreams. I hope all of you out there are as lucky as I am to have even one person in your life that inspires you to reach high, and try hard, because really, the mind can help you do just about anything.